PT Surveyor Indonesia (Persero) - PTSI is a reputable state-owned independent assurance services company in Indonesia. Based in Jakarta, PTSI engaged in Surveying, Verification, Inspection, Certification and Consultancy. PTSI has its business activities focused in 2 business process: Business Process related to Operations and Business Process related to Corporate Policy Establishment. PTSI is a state-owned company and is majority owned by the Government of Indonesia. At present, PTSI is 85.12% owned by the Government of Indonesia, 10.40% by Societe Generale de Surveillance SA, and 4.48% remaining shares by PT SUCOFINDO (Persero). 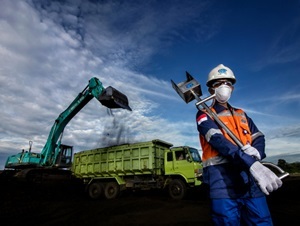 PTSI conducted business operations in all parts of Indonesia under the management of 11 domestic branches, 1 Singapore overseas branch office, 3 UWK offices, 3 representative offices and directly employs 1,581 employees. PT Surveyor Indonesia (Persero) also supported by 2 key subsidiary companies, namely PT Surveyor Carbon Consulting International (99.00%) and PT Synerga Tata International (60.00%). According to information found in PT Surveyor Indonesia (Persero) Annual Report 2016 as cited by JobsCDC.com, PTSI booked total revenue of Rp848.61 billion in 2016. This total revenue decreased by 0.15% compared to the year 2015 amounted to Rp849.86 billion. In year 2016, PTSI recorded a net profit of Rp89.80 billion or 1.79% decrease from Rp91.44 billion in 2015. Male/Female, not more than 26 years of age. Bachelor Degree from all major. Skilled in operating Illustrator/ Photoshop/ Corel/ Indesign. Skilled in operating Motion Graphic will be an added advantage. Creative individual and keen attention to detail. Minimum 1 year experience in the related field. Fresh graduate candidates are welcome. Mascot of PT Surveyor Indonesia (Persero). Concept, style, clothes, activity, color and typography adjusted to your signature style combined with the Company's standard style. The Company's standard style and references can be seen on the Company's Instagram. Logo header (BUMN and Surveyor Indonesia) at the top of poster. Social media footer at the bottom of poster. JobsCDC.com now available on android device. Download now on Google Play here. Please be aware of recruitment fraud. The entire stage of this selection process is free of charge. PT Surveyor Indonesia (Persero) - Fresh Graduate, Experienced Staff PTSI October 2018 will never ask for fees or upfront payments for any purposes during the recruitment process such as transportation and accommodation.